The pigeonhole principle: "If you put three pigeons in two pigeonholes at least two of the pigeons end up in the same hole." So where's the argument? Physicists say there is an important argument. While the principle captures the very essence of counting, the investigators said that they showed that in quantum mechanics it is not true. Science writers reporting on the physicists' findings heard resonance with that other blogger-comment favorite, Schrödinger's cat. They suggested that those mulling over counterintuitive implications of quantum physics now have one more animal-related paradox to think about, in the form of pigeons, if any, found in pigeonholes. 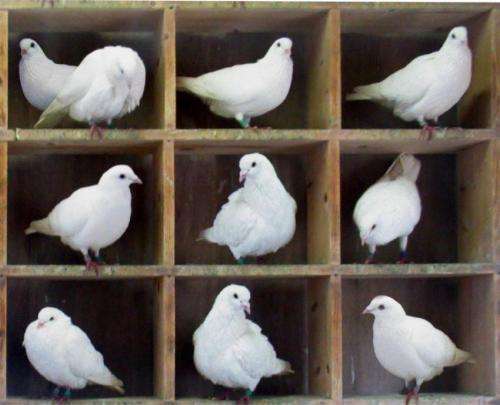 Physics World on Friday referred to "paradoxical pigeons" as the latest quantum conundrum. Scientists identified the paradox involving quantum pigeons; specifically, they have posed their findings on what the team calls the "quantum-pigeonhole effect." According to the team, when you put three pigeons in two pigeonholes, it is possible for none of the pigeons to share a hole. They found instances when three quantum particles, they wrote, put in two boxes "yet no two particple are in the same box." The team from California and colleagues in Israel, Italy and the UK are authors of the paper, "The quantum pigeonhole principle and the nature of quantum correlations," by Y. Aharonov, F. Colombo, S. Popescu, I. Sabadini, D.C.Struppa, and J. Tollaksen. The research is described on the arXiv preprint server. "It's one of those things that seem to be impossible," said co-author Jeff Tollaksen, physics professor at Chapman University, in Physics World, but it is a consequence of quantum mechanics. "In conclusion," said the authors," we presented a new quantum effect that requires us to revisit some of the most basic notions of quantum physics—the notions of separability, of correlations and of interactions." Marcus Woo, writing in Physics World on Friday, said, "They reckon that the effect will arise when an observer makes a sequence of measurements while trying to fit three particles in two boxes. First, you make an initial, "pre-selection" measurement of the locations of the particles. Next, you can perform an intermediate measurement to see whether two particles share a box. Finally, you make a final, "post-selection" measurement of the locations. You can make the pre-selection and post-selection measurements such that they are completely independent. In the intermediate step, you can make what's called a weak measurement to look at all three particles simultaneously. And when you do, it turns out that no two particles share a box. Is it like juggling --- three balls, two hands but at no time two balls are shared by the same hand. I guess it is the probability of finding each ball in the hand that constantly changes. After reading this article and several of the links provided I notice the experiment has never even been conducted. As it stands now it is pure speculation as to what would be the results. Unless I read the article wrongly I think they are making the claim that two quantum particles can occupy the same space at the same time. Quote from article: "According to the team, when you put three pigeons in two pigeonholes, it is possible for none of the pigeons to share a hole. They found instances when three quantum particles, they wrote, put in two boxes "yet no two particple are in the same box." I notice the experiment has never even been conducted. "They reckon that the effect will arise when an observer makes a sequence of measurements while trying to fit three particles in two boxes. I think they are making the claim that two quantum particles can occupy the same space at the same time. ...where m is less than n. Without there ever being more than one in one place. The experiment they propose seems straight forward/simple to set up. So I wouldn't be surprised if they (or another group) try this out within the coming few months. From what little I remember from high school science, Time was not an actual constant, we mostly view it as such so other sciences and maths work correctly. Does that also stand for Space therefore both are 'bending' for this Quantum Theory? I do remember being taught Quantum Physics breaks just about every science rule as it goes along. @TryingAtLeast: nah, quantum physics *is* the rules that underlie the rest of science. (For example, you can derive all of chemistry from the Schrodinger equation). But quantum physics is very unintuitive, because the way individual particles behave looks very different from how large groups of particles behave *on average. * It's like how you can have a set of numbers where the average is 5, but every number in the set is 1 or 10. We understand from relativity how space and time can get distorted around objects with very high speed or large mass, but a lot of the equations involved give nonsensical results if you try to apply them to the small-scale systems that quantum physics is about. Developing a good theory of quantum gravity (the physics of extremely dense objects) is one of the biggest research areas in modern physics. Quote from article: "According to the team, when you put three pigeons in two pigeonholes, it is possible for none of the pigeons to share a hole. They found instances when three quantum particles, they wrote, put in two boxes "yet no two particles are in the same box." Looks like a math "shell game". Do the damn experiment and THEN report on it.. The article seems to imply that something confusing is going on, but I can't see what. Is this supposed to be another one of those "quantum weirdness!!!" stories? I've never understood the media's presentation of quantum mechanics. Quantum gives us a very well-defined, and actually really simple set of rules for how things work. And yet, every time they do an experiment that confirms those rules, everybody reacts with "shock! horror!". I can't count the number of times they've blithered on about how bizarre quantum entanglement is supposed to be - newsflash, it isn't weird at all. It's exactly the kind of behavior you expect in a logic based universe. If it didn't behave that way - if it were classical for instance - now THAT would be incredibly disturbing. Not every scientist is an experimentalist. The interesting thing in the paper (if I read it right) is that you can partially decouple state from operator (interaction) and treat each independently depending on what type of measurement you do . That might mean (again: if I read it right...and I'm not 100% sure that I am) , that depending on whether you do post selection or not there are a number of cases in the probability distribution that entities will not interact even though 'by common sense' they should. For some reason this reminds me of the Monty Hall problem. You select door 1, he shows you door 2 and asks you if you want to change your mind. If you change your selection to door 3 you now have an increased chance of getting the prize. It's like the universe shifts beneath your feet because of new information. I think we should take the preposition that "'no two participle are in the same box'" as an article of faith. Also the usual use of the term "pigeonhole principle" is in information theory, in which it is used to prove that there is a limit to how much information can be compressed. This new quantum version potentially gives a theoretical end-run around that. For some reason this reminds me of the Monty Hall problem. You select door 1, he shows you door 2 and asks you if you want to change your mind. It's a lot weirder. You can construct the case where particle 2 is on the same path as particle 1 and where particle 3 is also on the same path as particle 1....BUT particles 2 and 3 are not on the same path. Interesting. You wouldn't believ e how many arguments I've had in information theory about this. Hi Forum. This article/discussion seems to 'gloss over' the fact that the proposed 'measurement method' involves a 'disjoint set' of separate measurements, not a 'singular measurement' per se. Hence any 'correlation' attributed to the overall 'collection' of 'quantum pigeons/locations' in play is only done afterwards, via a mathematical/statistical treatment/analysis construct is used to 'output' some resultant 'interpretation'. That interpretation/result 'correlation' is therefore merely an after-the-fact mathematical 'artifact', and not an actually any sort of 'directly real and present' physical situation. Most probably therefore, the observations from others regarding the real situation, that 'one quantum/pigeon' is always 'in transition' state between one-or-other 'hole', so no 'singular measurement' will be possible to 'identify' the 'in transition' one in any 'specific hole state'. Trap door at the back of one of the pidgeon holes. This certainly puts the cat among the pigeons. (couldn't help myself, the opportunity was just too good). Are the (virtual) pigeons are entering the holes at the same time? If so, are simultaneous measurements being made of each? Why did they use 3 pigeons and 2 holes and not 2 pigeons and 1 hole (simpler measurement issues)? - emit 3 electrons in a triangular pattern. If two electrons traveled down the same path side by side they should repel each other. So the spread for these two after detection should be wider (you get an asymmettric detection image). However, according to the math of QM it is possible that you get an event where this spread doesn't happen at all. Yeah, but.. what if they aren't exactly side by side? Maybe one in front and another half phase behind (or even full)? You can set up an emitter to guarantee that electrons are emitted at the same time (in the most crude way by causing emission via an ultra short laser pulse onto a substrate which defines the time window in which the electrons are emitted). In a more refinde way via electromagnets that chop a steady stream from a source of electrons up into packets of a defined size. Minor diferences in position along the way wouldn't change the outcome in any case. Multiple electrons along one path would still repel sideways - even if one were a bit more to the front than the other, as long as there is some lateral separation as well. Motl considers the weak measurement as a pseudoscience and all its proponents as his personal enemies. Which denies the main - if not only one - progress in theoretical quantum mechanics during last thirty years. He's essentially a conservative fundamentalist, which is sorta useful behavior for me, as it illustrates most of problems of contemporary physicists by crystalline example of their mediocrity. BTW the another famous bigot blog, which I enjoy a lot from the same reason. No one of both chaps does the active research in physics already, BTW. The principle of this paradox is in fact, you cannot determine the distribution of three particles at two places with single observation. You just need to memorize the state of this distribution before looking at another place - and this memory is a hidden element, which doesn't apply to single pass observation. This paradox has its counterpart in observation of supernatural phenomena at two different places in special relativity, for example in tunneling of photons during G. Nimtz's experiments. Seriously now, your jesting words may be closer to the truth of it than you think! Consider the possible configurational quantum states of the 'holes', ie, an OPEN duality-axis spin-state-accommodation 'hole' with NO 'back' to it. In other words, 'polar' states where 'anti-spin-entangled 'pigeon/electron 'pairs' may sit 'negative-pole-to-positive-pole' (a variation of 'Cooper Pairing' state, hence the two-in-one-hole' possible 'reality outcome' in 'double-ended' or 'polar' quantum 'configurational space' holes. Because that would be like doing a double slit experiment with a single slit. Doesn't work. You have to have indeterminacy on the 'which path' issue. If you just use one hole (one path) you have effectively made a (strong) measurement which kills the effect. Question from Whyde: "Why did they use 3 pigeons and 2 holes and not 2 pigeons and 1 hole..."
Answer from antialias: "Because that would be like doing a double slit experiment with a single slit. Doesn't work. You have to have indeterminacy on the 'which path' issue. If you just use one hole (one path) you have effectively made a (strong) measurement which kills the effect." Careful. While on face of it that 'answer/comparison' seems 'plausible/applicable', deeper scrutiny shows it is not. Two-slit scenarios has 'slits/holes' as 'intermediate way-point(s)', NOT 'final destination(s)'; since 'measurement' (or 'pattern') occurs at 'detector' BEYOND slits/holes. Whereas 3-into-2 (or 2-into-1) scenarios has 'holes' as TERMINUS for 'path'; which 'measurement' supposed to reflect; hence, irrespective of any 'path' mixing they do, eventually this 'setup' must involve pigeons/electrons 'paths' ending AT the 'hole(s)'. I posting in a kind of 'half joke' way. Having lived in East London as a kid keeping pigeons was no strange thing. In fact 'droppings' were a problem ha! However various owners did actually experiment with various types of housing, including cube enclosures which are NOT pigeon holes...they're different. In some cases the actual size of the enclosure didn't matter and two pigeons would try to occupy one which was too small even when the next door enclosure was free. Owners concluded that during flights certain pigeons might develope an affinity and retained that on return. I have no idea if that was true or not but the point I'm making is that what happens to the quantum particle during a journey might be important, e.g. slit experiments. Erm. You didn't read the paper, did you? Either that or you didn't understand it. There are pictures in it. Go have a look. The detector is set up at a point AFTER the paths are remerged. The 3-to-2 correspondece is the minimum setup needed to show this effect. There's no way to show it with a 2-to-1 setup. What about 4 pidgeons in 2 holes... (or any other combination). My guess (as an artist) is, that is when classical physics start coming into play with probabilities. Erm. You didn't read the paper, did you? Either that or you didn't understand it. There are pictures in it. Go have a look. The detector is set up at a point AFTER the paths are remerged. The 3-to-2 correspondece is the minimum setup needed to show this effect. There's no way to show it with a 2-to-1 setup. Of course I read and understood their paper/experimental setups/assumptions and maths analysis methodology. It is precisely because I understood it in properly and depth without making any facile 'cross-over' assumptions and comparisons (between 'interferometer' setups/experiments/interpretations and 'two-slit' setups/experiments/interpretations), that I saw immediately where the proposed interferometer 'sources', 'paths', 'holes' and 'detectors' functions/elements are completely different to the 'two-slit' functions/elements. A couple decades ago (as part of my 'from scratch ToE project reality-testing of physical/logicalToE indications) I did many and variously-modified experiments of the 'interferometer' and 'two-slit' types. 1) TWO-SLIT setups: 'particles' are NOT 'entangled or 'superposed' in any way, being 'individually' emitted; if anything IS 'entangled/superposed in any way, it is the TWO 'slits' themselves, which 'entagled/superposed states are affected by extraneous influences (such as the extra detector introduced to 'observe which slit' information, so 'collapsing' the two-slit 'entanglement/superposed states and 'resulting' in 'collapse' of the erstwhile 'interference pattern' accumulated on the main detector (I can't say any more because it risks some unscrupolous types plagiarising some results which will be part of my ToE publicationb). 2) INTERFEROMETER setups: In the above proposed experiments, the 'particles' are already in 'entangled' parallel beams even BEFORE they hit the first beam splitter; hence any further 'path' behvior/info is already determined by that intial 'collapse' of the 'triple electron ensemble' and effecting thereafter a probabilistic determination of which path (hole) they are in at that stage in the possible permutations.That is the 'first hole' where the ENTANGLEMENT of three particles effectivelyTERMINATED ...anything further is mere probability and post analytical mathematical 'treatment' which may not even relate to the final states at all, let alone to the first-beam-splitter 'collapse' of the entangled triple-electon state into random single electron OR double-'superposed states' compound-electron; both types of which will eventually 'hit' one detector or other but will be meaningless 'info' unless the intermediate states are known, and which (as the experimenters acknowledge) will not give the requisite 'no two in one hole' statistical data-unit for further meaningful 'maths' treatment. The final detectors are superfluous because the 'entanglement/supperposition' has already collapsed when the first beam-splitter HOLE is 'decided' by the 'path/entaglement permutations' thereafter.